In 1999, Robin Sharma sold a book about the very human desires of fulfilling dreams and reaching destinies. The story he wrote have become one of the most inspiring personal growth stories ever written. It was a tale of success and richness from beginning to end. The story opened with the success of a lawyer and ended with the richness of a man. The personality development journey of both characters from the book, Julian Mantle and his best friend John, is one that Robin Sharma wrote, in poetic prose, as a guidebook to life. If you came to the conclusion that you’ll only be happier after getting a title in front of your name, and secretly demand respect to come your way, then it’s time to reevaluate your definition of leadership, success and happiness. 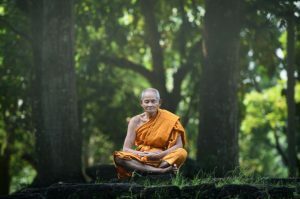 Take the first step to shifting your paradigm with these awesome life lessons from The Monk Who Sold His Ferrari. Some people believe that making mistakes are like making irreparable dents. It’s hard to let go of negative thoughts, especially criticism. Ironically, under the grand laws of nature, our mind can only hold one thought at a time. By making negative thoughts your focus, you’ll embody it, or worst, manifest it. This mentality could only hinder your personal growth. The biggest lesson from the book is how the quality of your life is determined by the quality of your thoughts. Julian Mantle transformed himself from a depressed, obese lawyer into a youthful, optimistic man — all by conquering his mind. Mastering your mind means seeing setbacks as opportunities. By envisioning your dreams, you give your mind the power to cultivate it and make it a reality. So occupy your mind with uplifting thoughts. You’ll come to realize, the power of cultivating a rich mentality will help you manifest the energy you’ll need to attain the success you desire. Imagine discovering a map that leads you directly to a treasure chest. That’s how exciting it would be when you discover your life’s purpose. But this idea appears as elusive as the leprechaun at the end of the rainbow. Laugh along the way because a day without laughter or a day without love is a day without life. These steps might seem simple and obvious, but what makes goals, success and destiny appear so elusive is because the pursuer have yet to arrive to self-knowledge. Self-Knowledge is the DNA of Self-Enlightenment. And like the towering lighthouse guiding lost ships to harbor, you’ll come to see that dedicating your life purposefully is the secret to success and happiness. “Never forget the importance of living with unbridled exhilaration. Never neglect to see the exquisite beauty in all living things. Today, and this very moment, is a gift. Question: Why should you build a strong character, be disciplined and optimistic? Answer: When you take the time to build your character, and fill it with power and energy, you can have anything and do anything you want. Because it’s impossible to do good when you don’t feel good. The lesson from the monk is that success on the outside begins within. When you identify the things that are holding you back, you should face them. Do the things you fear, because you’re building the foundation of success and leadership within yourself. Leading yourself first gives others the vote of confidence that you’re capable of leading them too. So act with integrity and be guided by your heart. “The Universe favors the brave. We’re all the more tempted and distracted today by the noises our devices make and the people we interact with on a daily basis. Here’s an exercise from the book you can apply to your life immediately. “I am more than I appear to be. It takes courage to nurture self-discipline because it’s not easy. But once you give yourself the power to be more than your environment, you’ll ultimately win and unshackle yourself from a mental prison. that have crept into the palace of your mind. How do you savor life to the fullest and not waste a single moment of your time? By reminding yourself that today could very well be your last day. So it’s high time you stop accepting a life of mediocrity. The only way to experience more is to push yourself to do more. Because only 20% of your time, dedicated to the day-to-day activities, yield lasting results that could influence the quality of your life. Being efficient with your time also means being ruthless about it. You have to have the courage to say “no”. Start small. By showing how much you value your time, others will learn to recognize it and as a consequence, respect you for it. Because, only enlightened people are priority driven. grains of sand, never to return again. Cultivating your mind to improve the quality of your life should run in parallel to your next action step of cultivating new perspective. Specifically one that revolves around the concept of giving. Giving more to life and to your community is a paradigm shifting perspective from the “self” mentality of survival of the fittest. Practicing gratitude and dedicating time to the act of giving, can help you find your purpose in the world. Expressing gratitude daily plants the seed within yourself that each day is sacred. The richer the relationship you build around you, the more abundance comes your way. Because in life, your time and energy are the two valuable resources you could offer to anyone. Remove the idea of the self and focus on the quality of your contribution. Ask yourself, what’s the point of climbing the steps of success if you have missed the first steps of your own kids? Many high-achievers can turn short-sighted when asked to choose a path in the dilemma. Sacrifice time spent with loved ones now and give them everything money can buy? Or sacrifice the promise of comfort, in favor of spending time with them now. So ask yourself again, if you would rather take each step along the way with awe and love or run through your days hoping to expedite your win towards an elusive pot of gold. At the end of the day, your happiness is a choice you have to make, and is a journey you have to take.